In recent year, the Internet of Things (IoT) has drawn significant research attention. IoT is considered as a part of the Internet of the future and will comprise billions of intelligent communicating ‘things’. The future of the Internet will consist of heterogeneously connected devices that will further extend the borders of the world with physical entities and virtual components. The Internet of Things (IoT) will empower the connected things with new capabilities. In this survey, the definitions, architecture, fundamental technologies, and applications of IoT are systematically reviewed. Firstly, various definitions of IoT are introduced; secondly, emerging techniques for the implementation of IoT are discussed; thirdly, some open issues related to the IoT applications are explored; finally, the major challenges which need addressing by the research community and corresponding potential solutions are investigated. Bi, Z., Xu, L., & Wang, C. (2014). Internet of Things for enterprise systems of modern manufacturing. IEEE Transactions on Industrial Informatics. doi: 10.1109/TII.2014.2300338. Bluetooth SIG. (2014). Generic Attributed Profile (GATT). Bluetooth SIG Specification, https://www.bluetooth.org/en-us/specification/assigned-numbers/generic-attribute-profile. Cai, H., Xu, L., Xu, B., Xie, C., Qin, S., & Jiang, L. (2014). IoT-based configurable information service platform for product lifecycle management. IEEE Transactions on Industrial Informatics. doi: 10.1109/TII.2014.2306391. Chi, Q., Yan, H., Zhang, C., Pang, Z., & Xu, L. (2012). A reconfigurable smart sensor interface for industrial WSN in IoT environment. IEEE Transactions on Industrial Informatics. doi: 10.1109/TII.2014.2306798. EPCglobal. (2013). Radio-frequency identity protocols class-1 generation-2 uhf rfid protocol for communications at 860–960 MHz, Version 1.2.0, http://www.gs1.org/gsmp/kc/epcglobal/uhfc1g2/uhfc1g2_1_1_0-standard-20071017.pdf. ETSI. (2013). The European Telecommunications Standards Institute, [cited 2013 May 20]; available from http://www.etsi.org/. Fan, Y., Yin, Y., Xu, L., Zeng, Y., & Wu, F. (2014). IoT based smart rehabilitation system. IEEE Transactions on Industrial Informatics. doi: 10.1109/TII.2014.2302583. Fang S., Xu, L., Zhu, Y., Ahati, J., Pei, H., Yan, J., et al. (2014). An integrated system for regional environmental monitoring and management based on Internet of Things. IEEE Transactions on Industrial Informatics. doi: 10.1109/TII.2014.2302638. Fleisch, E. (2013) What is the Internet of things? [cited 2013 May 20]; available from http://www.im.ethz.ch/education/HS10/AUTOIDLABS-WP-BIZAPP-53.pdf . He, W., Yan, G., & Xu, L. (2014) Developing vehicular data cloud services in the IoT environment. IEEE Transactions on Industrial Informatics. doi: 10.1109/TII.2014.2299233. Hernandez-Castro, J. C., Tapiador, J., Peris-Lopez, P., & Quisquater, J. (2013). Cryptanalysis of the SASI ultra-light weight RFID authentication protocol, [cited 2013 May 20]; available from http://arxiv.org/abs/0811.4257 . IERC. (2013). Coordinating and building a broadly based consensus on the ways to realise the internet of things in Europe, [cited 2013 May 20]; available from http://www.internet-of-things-research.eu/pdf/Poster_IERC_A0_V01.pdf. ITU. (2013). The internet of Things, International Telecommunication Union (ITU), Internet Report [cited 2013 May 20]; available from http://www.itu.int/dms_pub/itu-s/opb/pol/S-POL-IR.IT-2005-SUM-PDF-E.pdf. Jiang, L., Xu, L., Cai, H., Jiang, Z., Bu, F., & Xu, B. (2014). An IoT oriented data storage framework in cloud computing platform. IEEE Transactions on Industrial Informatics. doi: 10.1109/TII.2014.2306384. Joshi, G. P., & Kim, S. W. (2013). Survey, nomenclature and comparison of reader anti-collision protocols in RFID, IETE Technical Review, [cited 2013 May 20]; available from http://tr.ietejournals.org/text.asp?2008/25/5/285/44659. Kang, K., Pang, Z., Xu, L., Ma, L., & Wang, C. (2014). An interactive trust model for application market of the Internet of Things. IEEE Transactions on Industrial Informatics. doi: 10.1109/TII.2014.2306799. Kranenburg, V. (2013). Moscow futurodesign lab co-create urban intelligence: designing smart interfaces between people and city, [cited 2013 May 20]; available from http://www.theinternetofthings.eu/content/moscow-futurodesign-laboratory-workshop-co-create-urban-intelligence-designing-smart-interfa. Krapelse, H. J. (2013). RFID application in healthcare – scoping and identifying areas for RFID deployment in healthcare delivery, RAND Europe. [cited 2013 May 20]; available from http://www.rand.org/pubs/technical_reports/TR608z1.html. Li, L., Li, S., & Zhao, S. (2014a). QoS-aware scheduling of service-oriented Internet of Things. IEEE Transactions on Industrial Informatics. doi: 10.1109/TII.2014.2306782. Li, S., Oikonomou, G., Tryfonas, T., & Chen, TM. (2014). A distributed consensus algorithm for decision-making in service-oriented Internet of Things. IEEE Transactions on Industrial Informatics. doi: 10.1109/TII.2014.2306331. Marry, W. (2013). Disruptive civil technologies six technologies with potential impacts on us interests out to 2025, [cited 2013 May 20]; available from http://swemgovdocs.blogs.wm.edu/. Mitrokotsa, A., Rieback M. R., & Tanenbaum, A. S. (2013). Classifying RFID attacks and defences. [cited 2013 May 20]; available from http://www.cs.vu.nl/~ast/publications/isf-2009.pdf. Pretz, K. (2013). The Next Evolution of the Internet. 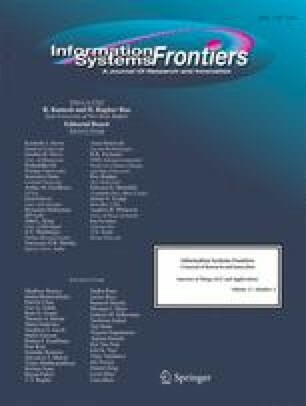 [cited 2013 May 20]; available from http://theinstitute.ieee.org/technology-focus/technology-topic/the-next-evolution-of-the-internet. Tao, F., Cheng, Y., Xu, L., Zhang, L., & Li, B. (2014a). CCIoT-CMfg: cloud computing and Internet of Things based cloud manufacturing service system. IEEE Transactions on Industrial Informatics. doi: 10.1109/TII.2014.2306383. Tao, F., Zuo, Y., Xu, L., & Zhang, L. (2014b). IoT based intelligent perception and access of manufacturing resource towards cloud manufacturing. IEEE Transactions on Industrial Informatics. doi: 10.1109/TII.2014.2306397. Vermesan, O. (2013). CERP-IoT strategic research agenda. [cited 2013 May 20]; available from http://www.rfid-in-action.eu/cerp/. Viriyasitavat, W., Xu, L., & Viriyasitavat, W. (2014a). Compliance checking for requirement-oriented service workflow interoperations. IEEE Transactions on Industrial Informatics. doi: 10.1109/TII.2014.2301132. Viriyasitavat, W., Xu, L., & Viriyasitavat, W. (2014b). A new approach for compliance checking in service workflows. IEEE Transactions on Industrial Informatics. doi: 10.1109/TII.2014.2301143. Wang, C., Bi, Z., & Xu, L. (2014). IoT and cloud computing in automation of assembly modelling systems. IEEE Transactions on Industrial Informatics. doi: 10.1109/TII.2014.2300346. Xiao, G., Guo, J., Xu, L., Gong, Z. (2014). User interoperability with heterogeneous IoT devices through transformation. IEEE Transactions on Industrial Informatics. doi: 10.1109/TII.2014.2306772. Xu, L., & Viriyasitavat, W. (2014). A novel architecture for requirement-oriented participation decision in service workflows. IEEE Transactions on Industrial Informatics. doi: 10.1109/TII.2014.2301378. Xu, B., Xu, L., Cai, H., Xie, C., Hu, J., & Bu, F. (2014). Ubiquitous data accessing method in IoT-based information system for emergency medical services. IEEE Transactions on Industrial Informatics. doi: 10.1109/TII.2014.2306382. Zheng, X., Martin, P., Brohman, K., & Xu, L. (2014a). CLOUDQUAL: a quality model for cloud services. IEEE Transactions on Industrial Informatics. doi: 10.1109/TII.2014.2306329. Zheng, X., Martin, P., Brohman, K., & Xu, L. (2014b). Cloud service negotiation in IoT environment: a mixed approach. IEEE Transactions on Industrial Informatics. doi: 10.1109/TII.2014.2305641.